In many respects, there is a broad public consensus when it comes to the federal budget deficit: seven-in-ten say it is a major problem that must be addressed right away, and roughly two-thirds say that the best way to reduce the deficit is through a combination of cutting major government programs and increasing taxes. These views cross partisan lines, with majorities of Republicans, Democrats and independents saying we must deal with it now, and that the best approach involves both program cuts and tax increases. Yet this general consensus evaporates when concrete deficit reduction proposals are tested. And the Bowles-Simpson commission’s effort to package spending cuts and tax increases into a comprehensive package has met with far more public opposition than support. 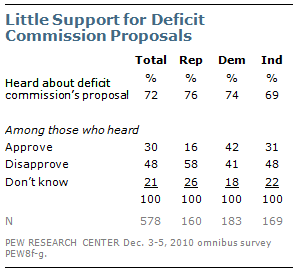 Among those who have heard of the deficit commission’s proposal, 48% disapprove and just 30% approve. The latest national survey by the Pew Research Center for the People & the Press, conducted Dec. 1-5 among 1,500 adults finds that the deficit commission is not the only group that faces public skepticism when it comes to deficit reduction proposals. Neither Republican nor Democratic congressional leaders have much credibility on this issue, with majorities saying they have little or no confidence in each when it comes to dealing with the deficit. 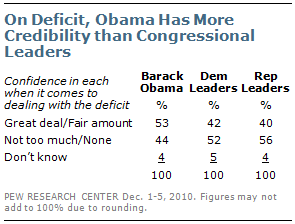 Obama is viewed more positively, by comparison, with a slim majority expressing at least a fair amount of confidence in his leadership on the deficit. Most of the major deficit reduction proposals under discussion meet with public disapproval. Particularly unpopular are provisions that would tax the health insurance people receive from their employers (72% disapprove), raise the national gasoline tax (74% disapprove), and reduce federal funding to states for things like education and roads (71% disapprove). Of 12 ideas tested, just two meet with majority approval: increasing the amount of earned income that is subject to Social Security withholding (64% approve) and freezing the salaries of government workers (59% approve); the latter proposal is supported by President Obama and many Republicans. 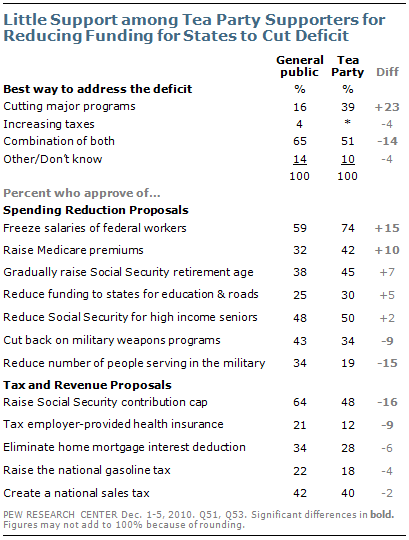 The public is skeptical that much progress will be made in reducing the deficit in coming years. Just 37% think we will have made significant progress in reducing the federal budget deficit over the next five years, while 52% think we will not. 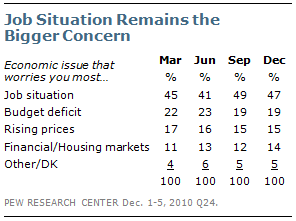 And reflecting the broad economic problems facing the nation, the deficit ranks far below the job situation as the biggest economic worry for most people, with no increase in focus on the deficit over the course of the year. In the new survey, 47% cite the job situation as the economic issue that most worries them, while fewer than half as many (19%) cite the budget deficit. There is broad, and bipartisan, agreement that the best approach to reducing the federal budget deficit involves a combination of both government cutbacks and increased taxes. Roughly two-thirds (65%) express this view, including majorities of Republicans (58%), Democrats (72%) and independents (67%). Relatively few Americans (16%) believe that focusing mostly on cutting major government programs is the best approach to take. Even among Republicans, only about a third (32%) say a strategy focused mostly on cutting government is the right line of attack. 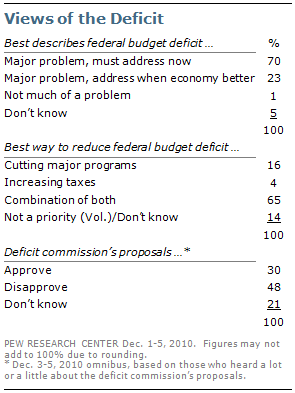 Even fewer Americans (4%) believe the best way to reduce the deficit is through a focus on increasing taxes. Yet the recent proposals by a presidentially appointed bipartisan deficit reduction commission have met with far more public resistance than acceptance. Nearly three-quarters (72%) of Americans say they have heard about the commission’s proposals, and disapproval outweighs approval by a 48% to 30% margin among those who heard about them. Republicans, in particular, view the commission’s proposals negatively – 58% disapprove and just 16% approve. Democrats are divided about evenly over the commission’s proposals (42% approve, 41% disapprove). Of 12 individual proposals for reducing the federal budget deficit, only two – raising the current cap on payroll tax contributions to Social Security and freezing the salaries of government workers – receive majority support. Fully 77% of Democrats support making Social Security payroll taxes apply to more of high-earners’ incomes, as do 65% of independents. Republicans are less unified, but still about half (53%) back this idea. Freezing the salaries of federal government workers receives roughly the same level of support from Republicans (64%), Democrats (57%) and independents (62%) alike. Another proposal – reducing Social Security benefits for seniors with higher incomes – divides the American public; 48% approve and 47% disapprove with no difference of opinion across party lines. Two of the largest partisan gaps are on issues related to reducing military spending. Roughly half of Democrats (53%) approve of cutting back on military weapons programs as a way of reducing the deficit; 71% of Republicans disapprove of this idea. Republicans are equally opposed (70%) to reducing the number of people serving in the military. In this case, most Democrats (55%) share this opposition, though by a slimmer margin. Republicans are also less supportive than Democrats of two tax proposals: a national sales tax and an increase in the gasoline tax. Republicans disapprove of the sales tax idea by a 62% to 33% margin, while both Democrats and independents are more evenly divided. On the gasoline tax, both Republicans and independents overwhelmingly reject a higher gas tax as a means of reducing the deficit (79% of each disapprove). 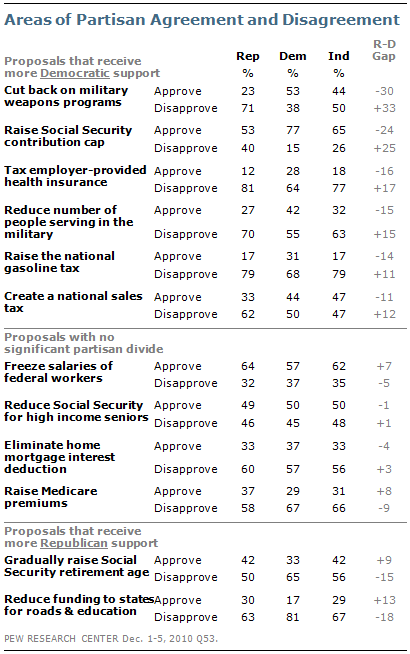 Roughly two-thirds of Democrats (68%) also oppose raising the gasoline tax. Republicans are somewhat more willing than Democrats to rethink Social Security and Medicare benefits in the interest of deficit reduction. While Democrats disapprove of gradually raising the Social Security retirement age by a two-to-one margin (65% disapprove, 33% approve), half (50%) of Republicans disapprove while 42% approve. Republicans also are slightly more supportive of raising the amount people on Medicare contribute to cover their health care costs (37% of Republicans, 29% of Democrats), though most disapprove of this idea across party lines. The deficit is seen as an especially pressing issue to those who agree with the Tea Party movement. While seven-in-ten Americans (70%) say it is a major problem that the country must address now, that figure rises to 84% among those who agree with the Tea Party. Tea Party supporters are more likely to favor addressing the deficit mostly by cutting major programs (39%) than are Americans generally (16%). 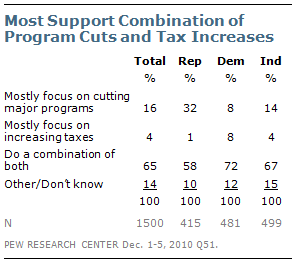 Yet Tea Party supporters do not flatly reject tax increases as part of the deficit solution; roughly half (51%) believe that the best way to address the deficit is through a combination of major program cuts and tax increases. Nor are Tea Party backers clearly more willing to reduce entitlement spending. Those who agree with the Tea Party are somewhat more supportive of making Medicare recipients pay a larger share of their health care costs, though about half (54%) oppose this idea. Tea Partiers are not significantly more supportive than other Americans of raising the retirement age or means-testing Social Security benefits. Moreover, people who agree with the Tea Party are among the most resistant to reductions in military spending – 79% oppose reducing military personnel levels, and 62% oppose cutting back on military weapons programs, compared with 61% and 50%, respectively, of the general public. 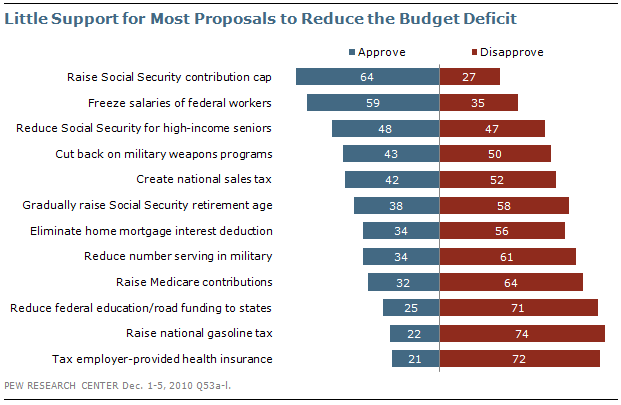 People who agree with the Tea Party are less supportive of many major tax proposals aimed at deficit reduction. While the public backs increasing the amount of earned income that is subject to Social Security withholding by two-to-one (64% approve, 27% disapprove), Tea Partiers are divided (48% approve, 47% disapprove). Tea Party supporters overwhelmingly reject (81% disapprove) taxing employer-provided health care benefits; a smaller majority of the public (72%) opposes this proposal. 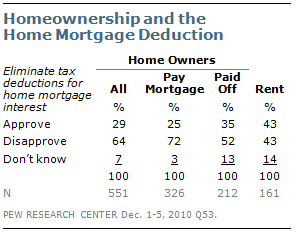 And 67% of Tea Party supporters oppose eliminating the home mortgage interest deduction, compared with 56% of the public at large. But Americans who agree with the Tea Party are no more opposed to a national sales tax than the public in general: 40% of Tea Party supporters approve of a national sales tax as a deficit reduction measure while 53% oppose, which is comparable to the 42% to 52% margin nationwide. Many of the deficit reduction ideas under discussion would have a differential impact on people at different stages of life. And not surprisingly, age is linked to reactions to some of the key provisions – particularly those that would impose new taxes on workers and homeowners. For example, younger Americans are more open to the idea of a national sales tax as a means of reducing the budget deficit. People ages 18 to 39 are divided about evenly as to whether they approve (47%) or disapprove (49%) of this idea. Among those age 65 and older, only 34% approve of this while 53% disapprove. And while taxing employer-provided health insurance benefits is deeply unpopular across all age groups, there is slightly more support among younger Americans (28% approve among those 18 to 39) than among older Americans. One generally popular proposal – freezing the salaries of government employees – meets with more resistance among younger Americans. Favored by 70% of those 65 and older, and 61% of those 40 to 64, a government salary freeze is backed by just half (50%) of adults under 40, while a roughly equal number of younger people (48%) disapprove. One of the largest age differences is on the issue of eliminating the home-mortgage interest tax deductions. 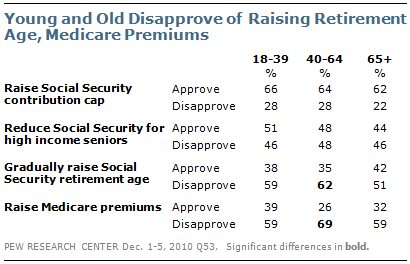 Among adults under age 40, 43% approve of this proposal, while 49% disapprove. This proposal is opposed by two-to-one (60% vs. 30%) among adults 40 and older. Much of this is linked to the life cycle of homeownership. Fewer than half (46%) of adults under 40 own their home, compared with about eight-in-ten Americans 40 to 64 (77%) and 65 and older (80%). And any change in the mortgage interest would affect a majority of adults between 40 and 64, 56% of whom are currently paying off a home mortgage. Just 20% of seniors are paying a mortgage because most (58%) own a home and have paid it off. Just 35% of adults under 40 are paying a mortgage because most (53%) either rent or have other living arrangements. Overall, the idea of eliminating the home-mortgage interest deduction as a way to reduce the federal budget deficit is opposed by homeowners by two-to-one (64% disapprove, 29% approve). And mortgage status matters; 72% of those still making mortgage payments disapprove of the idea, compared with 52% of homeowners who have paid for their home. The idea of eliminating the mortgage interest deduction is not nearly as offensive to renters – 43% approve of the idea, while 43% disapprove. When it comes to proposals that would change the way Social Security and Medicare operate, there are at most only modest differences in how different age groups react. Regardless of age, wide majorities approve of increasing the amount of earned income that is subject to Social Security withholding. Similarly, young, middle-aged, and older Americans are all about evenly divided over whether reducing Social Security payments for higher income seniors is acceptable as a way to address the deficit. Majorities in all age groups oppose increasing the amount Medicare recipients contribute to cover their health care costs, with the broadest disapproval coming from people between ages 40 and 64. More than half in all age groups also disapprove of a gradual increase in the retirement age, though opposition is somewhat lower among those who are already 65 or older (51% oppose) than among adults who are under 65 (60% oppose). Just 37% of Americans think we will make significant progress in reducing the federal budget deficit over the next five years, while 52% say we will not. This is a slightly more pessimistic assessment than the public offered as deficits were growing in 1989. At that time, 40% thought progress would be made, while 46% did not. The public’s outlook is divided along partisan lines. Most Democrats (53%) believe the country will make progress over the next five years, while most Republicans (60%) do not. 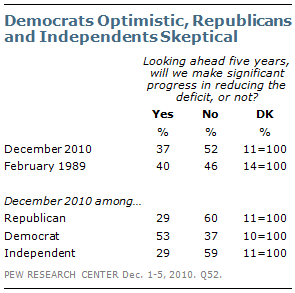 Independents are just as skeptical as Republicans on this question – just 29% believe the country will make progress on the deficit by 2015, while 59% think we will not. Neither Republican nor Democratic congressional leaders garner much public confidence when it comes to the deficit, especially outside of their own partisan base. In particular, only 37% of independents say they have a great deal or fair amount of confidence in Democratic leaders, and 35% say the same about Republican leaders. Instead, most independents say they have little or no confidence in both (59% for Democratic leaders, 62% for Republican leaders). Compared with congressional leaders, Barack Obama has somewhat more credibility. Overall, 52% of Americans say they have at least a fair amount of confidence in Obama, and this includes half (50%) of independents. 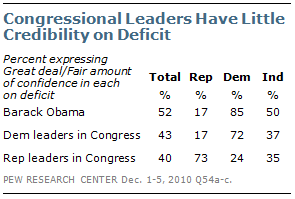 Still, 48% of independents say they have little or no confidence in Obama on the deficit. Republicans are equally skeptical of both Obama and Democratic leaders; 17% say they have a great deal or fair amount of confidence in each, while about eight-in-ten express little or no confidence. Democrats are about equally skeptical of Republican leaders in Congress (24% great deal or fair amount, 74% little or no confidence). Republicans and Democrats are about equally confident in their own party’s congressional leaders – 73% of Republicans and 72% of Democrats feel at least a fair amount of confidence in their party’s leaders on the deficit. An even greater number of Democrats (85%) say they have a great deal or fair amount of confidence in Barack Obama when it comes to dealing with the budget deficit.